DANA POINT — The Dana Point Boaters Association (DPBA) Boater Liaison Program — a new initiative that provides Dana Point Harbor boaters a forum to ask questions of public officials and agencies, make suggestions and share their views — has released its first series of responses to questions submitted by the public. Nine issues, ranging from a request for Wi-Fi service to a question about how the slip waiting list is managed, are covered in the initial report. The report features combined responses from DPBA and OC Dana Point Harbor officials. The Boater Liaison program was launched with the intent at improving boater satisfaction and advocacy in the harbor. Boaters submit a question, suggestion or issue of concern via the association’s website, and then DBPA board members take those concerns and ideas to the appropriate agencies for their consideration and response. The board then communicates the response to the boater who submitted the question. “We didn’t expect a perfect resolution to every issue, but we do expect to achieve clarity and progress on these issues on behalf of our boaters,” said James Lenthall, DPBA vice president. Since the Boater Liaison Program was established in May, DPBA board members have reviewed every question submission, then organized the submissions before selecting which topics to present to harbor management for discussion. In answer to a request for Wi-Fi access for boaters, OC Dana Point Harbor responded that provision for harborwide Wi-Fi service has previously been investigated but was not pursued, due to the cost of implementing such a program. According to harbor officials, the necessary administration and maintenance of a Wi-Fi system is not something the harbor administration is prepared to handle. Limited Wi-Fi is currently offered through Dana West Yacht Club, Aventura Sailing and Dana Point Yacht Club. DPBA said it will closely monitor all issues pending action and will continually request updates from OC Dana Point Harbor. Boaters will be notified by DPBA of progress being made on these issues. “With such intense demand for Dana Point boat slips, it is vitally important to boaters on the waitlists that slips are assigned based on a fair, equitable, transparent and properly monitored and enforced policy,” Lenthall said. 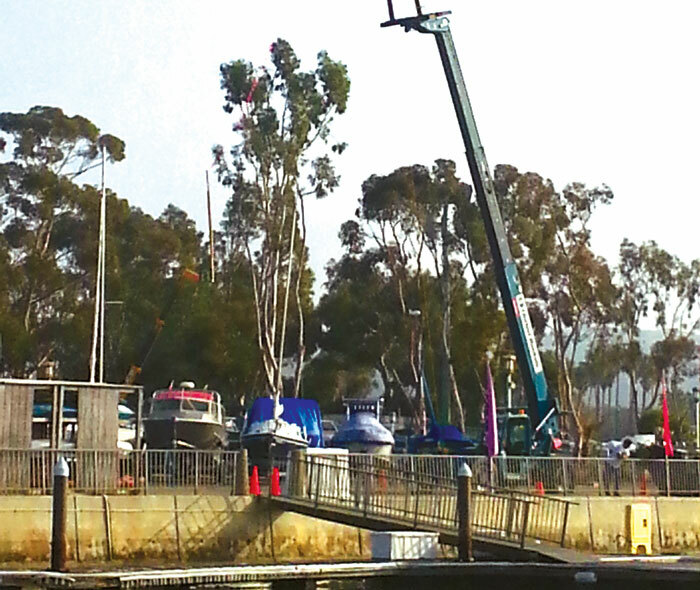 OC Dana Point Harbor officials explained that the harbor prohibits the transfer of slips with the sale of a vessel and has one of the strictest policies in Southern California in this regard. To ensure that this policy is enforced, the department utilizes various methods — such as only allowing a tenant of record to pay slip fees or be named as a billing party, and requiring that the tenant’s name be on the boat’s insurance and registration documents. “Attempts to circumvent waitlist policies have (resulted) and will result in the termination of the Boat Slip License Agreement,” OC Dana Point Harbor confirmed. Issue: Construction of the commercial areas of the harbor are scheduled to precede waterside redevelopment, which has raised concerns by boaters that the new marina may be compromised by the commercial center, or that boaters will bear the expense of any missteps or excessive expenses in the landside development. OC Dana Point Harbor response: The Orange County Board of Supervisors determined the landside amenities would be replaced (first), to be followed by the waterside amenities. Soon after construction begins on the landside in 2014-2015, the focus and majority of work will then be on the waterside. All revenues generated in the harbor must remain dedicated to the harbor, and the county does not differentiate between landside and waterside expenses or revenue. Issue: Boaters raised a concern that their slip fees could be redirected to cover non-harbor expenses. Is there a process to audit the harbor budget — and can is it accessible to the public? OC Dana Point Harbor response: All revenues generated in the harbor is dedicated to the harbor. The annual budget, as well as the five-year strategic plan, is prepared and approved per county requirements and remains available for public review under the CEO Budget website, at ocgov.com. The California State Lands Commission periodically reviews expenditures for compliance with grant requirements. “Since publishing our report, we have received several follow-up issues submitted via our Boater Liaison Program webpage, seeking additional information or clarification on the original responses — in addition to entirely new issues to be addressed by DPBA and harbor management,” Lenthall said. The organization is in the process of reviewing new submissions with plans to meet with OC Dana Point Harbor management to discuss those issues before the end of the summer, Lenthall said. To submit a request, visit danapointboaters.org and click on the Boater Liaison Submission Form. Boaters will then be required to provide their contact information, which agency they want the board to raise the issue with, and a description of the issue. A complete list of the Boater Liaison Program’s initial report questions and responses can be found at danapointboaters.org.